Liz Doherty has spent the past 16 years assisting clients in the life sciences with a wide range of US patent law issues. Since a patent strategy is part of an overall business strategy, Liz works closely with clients to align intellectual property and business goals. Liz has worked with many types of clients, from recent start-ups to large multinationals to research foundations to venture funds. The technologies on which she has focused include antibodies and other protein biologic drugs, methods of medical treatment, diagnostic methods and biomarkers, omega-3 fatty acid pharmaceuticals, non-natural nucleic acids, genomic sequencing methods, immunology methods, novel plant lines, and related agricultural methods, medical devices, and bioinformatics. 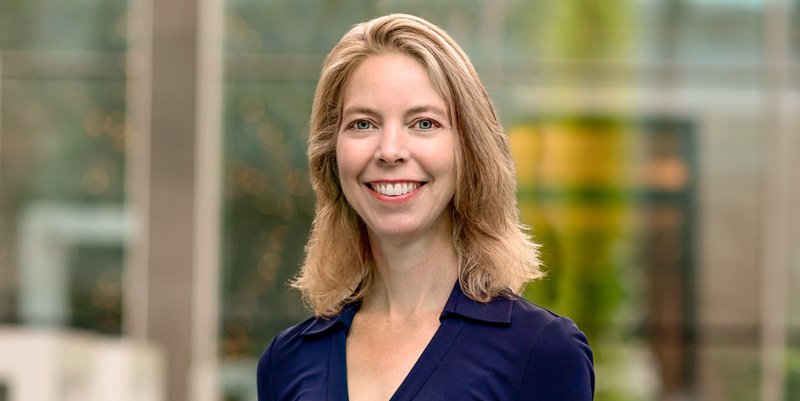 Before becoming a patent lawyer, Liz obtained a PhD in Molecular Biophysics and Biochemistry from Yale University, where she worked in the laboratory of Dr. Jennifer Doudna, focusing on the structure of large RNA molecules. And before joining McNeill Baur, Liz spent 14 years at Finnegan, Henderson, Farabow, Garrett & Dunner, LLP, in Finnegan’s Washington, DC, California, and European offices. Liz’s current work focuses on helping clients to develop patent strategies for their research projects, conducting due diligence and freedom to operate analyses, and preparing legal opinions, as well as drafting new patent applications and prosecuting US patent application portfolios. She has also prepared inter partes review (IPR) petitions and assisted a patent owner successfully defend all of its patent claims in an inter partes reexamination before the US Patent and Trademark Office. Liz spent a decade working in Europe and has interfaced extensively with European patent attorneys, both as clients and as colleagues. As a benefit of her tenure in Europe, she has worked frequently with European patent attorneys to improve the drafting of new patent applications in order to avoid common pitfalls that arise due to the differences in law and procedure between the US Patent and Trademark Office and the European Patent Office. Coordinating patent and regulatory strategies for new drugs and biologics is also an important aspect of Liz’s work. For example, she has counseled clients on non-patent exclusivities and US patent term extensions, and has helped clients to list patents in the US Food and Drug Administration Orange Book. During her legal career, Liz has also worked on several United States patent litigations, including three Abbreviated New Drug Application (ANDA) litigations. “Navigating through the Obviousness-Type Double Patenting Minefield,” Landslide 10 (3), January/February 2018 (coauthor). “New changes in US patent term adjustment calculations after Novartis v. Lee,” Pharmaceutical Patent Analyst, May 2015 (coauthor). “Changes in U.S. Patent Law: Important Developments for Biopharmaceutical Companies Active in the U.S. Market,”Pharmazeutische Medizin, July 2014 (coauthor). “Novartis v. Lee: A New Method for Calculating Patent Term Adjustment,” CIPA Journal, February 2014 (coauthor). “March Madness: Preparing for the U.S. Transition to a ‘First-Inventor-to-File’ System,” CIPA Journal, December 2012 (coauthor). “A European Patent Office Tool that Deserves Another Look,” Law360, October 23, 2012 (coauthor). “A Universal Mode of Helix Packing in RNA,” Nature Structural Biology, 2001 (first author). “Ribozyme Structures and Mechanisms,” Annual Review of Biochemistry, 2000 (first author). “Due Diligence Propriété Intellectuelle,” half-day seminar for ASPI, Paris, France, September 24, 2015. "US Patent Law, SEPIA program for advanced patent examiners," European Patent Office, The Hague, Netherlands and Munich, Germany, June 9 and 14, 2016. "The Biosimilar Patent Landscape," seminar for Parendreral Drug Association, West Coast Chapter, San Francisco, CA, June 16, 2016. "Advanced Patent Prosecution Workshop," two-day course sponsored by Practicing Law Institute (PLI) San Francisco, CA August 18-19, 2016. “U.S. Patent Law and Procedure,” SEPIA seminar program for senior European Patent Office examiners, The Hague, Netherlands, and Munich, Germany, October 16 and 23 and November 19, 2014. “U.S. Patent Formalities,” full-day course sponsored by Management Forum, London, UK, October 8, 2014. “U.S. Patent Formalities Update,” International Patent Administrators’ Group (IPAG) 11th annual meeting, London, UK, October 2, 2014. “Subject Matter Eligibility in the U.S. in the Wake of Myriad and Mayo,” C5 Biotech Patenting conference, sponsored by C5, Munich, Germany, March 27, 2014. “U.S. Patent Law,” full-day course sponsored by European Patent Institute (EPI), Eindhoven, Netherlands, November 22, 2013. “U.S. Patent Law,” full-day course sponsored by Forum Institüt für Management, Munich, Germany, October 10, 2013. “Second Medical Use Patents” panel session, Association Internationale pour la Propriété Intellectuelle (AIPPI) Forum and Executive Committee meeting, Helsinki, Finland, September 5-11, 2013. “What Every Life Sciences Company Management Needs to Know about Patent Protection,” half-day course sponsored by BioM, Munich, Germany, January 13, 2013. “The America Invents Act: Understanding the New Law,” 16th Annual ICPM Meeting, Barcelona, Spain, November 14, 2012. “Lessons from the Field: Protecting your Pharmaceutical Inventions,” Licensing Executives Society (LES), Benelux chapter, topic meeting, Liège, Belgium, October 11, 2012. “La Réforme du Droit Américain des Brevets,” full-day course sponsored by Forum Institüt für Management, Paris, France, December 13, 2011. “How to Navigate through Antibody Claims and Personalized Medicine/Biomarkers in the US,” 21st Forum on Biotech Patenting, sponsored by C5, London, UK, October 5-6, 2011.